Dark Stone Gang was in pursuit of the remains of an Indian monk, believed to have magical power. They had finally found half of the remains at Prime Minister Zhang's house, killed the whole household. Top assassin, Drizzle, flee with the remains and encountered a monk, Wisdom. They fell in love while Wisdom guided her to the right path of enlightenment and even sacrificed himself, hoping she will stop killing people. She was so guilty that she went to a famous surgeon to change her face and also leave her past behind. Turning over a new leaf, she leads a new humble life as Zeng Jing and met Ah Sheng who eventually marries her. Their peaceful life turned chaotic after a bank robbery when her trail became known to the Dark Stone Gang. It's an intense fantasy movie with a whiff of romance and loads of creative fighting scenes. 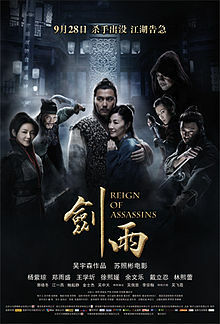 Although in Mandarin (I can't understand nuts, had to read the English subtitle most of the time), I totally enjoyed it as it kept me on my toes most of the time. Some of the plots were a little overdone or unrealistic but it suited the movie. Michelle still has the gist and moves, superb fighting and acting skills! Her leading man, Jung Woo-sung, was compatible to her hence they made a great couple in the movie. Just found out that it was partly directed and produced by John Woo... which explained the fantastic outcome of this movie... go figure!